Variable Exhaust Nozzles on the F-14 Tomcat. 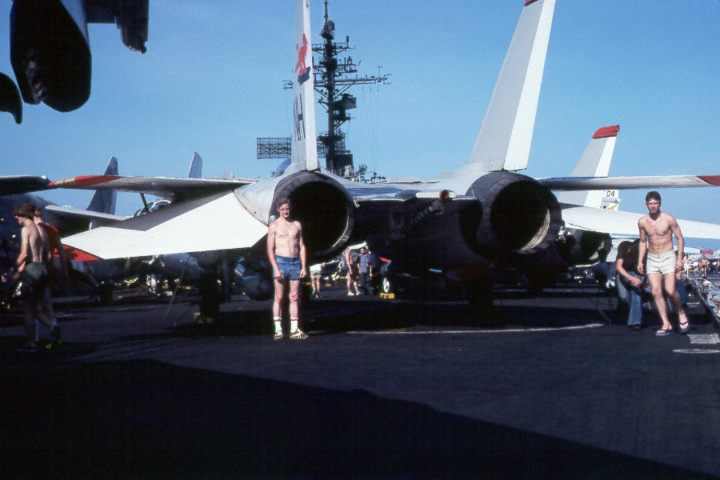 From VF-114, the Flying Aardvarks, on the deck of the aircraft carrier USS Kitty Hawk, CV63. If you can tell me more about the variable exhaust nozzles, send me e-mail. Look at the large engines. These engines have variable exhaust nozzles that varies in size in accordance to the amount of power applied. I imagine they also took the outside air pressure into account (the higher you go the lower the pressure) and varied the size of the exhaust nozzles to produce the most efficient thrust according to the outside air pressure. When the engine was at idle the exhaust size was the largest. When the engine was set to full 0009912HSPACE=10 VSPACE=10 BORDER=2 height=125 width=252 align=RIGHT>throttle without using the afterburner, the exhaust nozzle size was the smallest. There were five stages of afterburner on the F-14. When the engine was set to full afterburner the exhaust nozzles were again set to full size. Do you remember the UHT (Unit Horizontal Tail) on the A-7 Corsairs? Both sides of the horizontal tail were physically connected together so that when one side moved, the other side moved. This is different on the F-14 Tomcat. The flight control system was a fly by wire system. This means when the pilot moves the control stick he tells the computer where he wants the airplane to go. The computer, in turn, moves the control surfaces turning the airplane. It was interesting to look at this operation in work while the plane was in final approach. I used to go up to the crows nest. It's funny, other than the crow on my sleeve, I never saw a crow up there. You can see these aircraft very clearly as they landed on the deck. The horizontal tail on the F-14 was very different than any other aircraft at that time. The left side horizontal stabilizer would be 0009561HSPACE=10 VSPACE=10 BORDER=2 height=125 width=265 align=RIGHT>moving down while the right side would be moving up. Or, sometimes, both sides would move in the same direction. These movements were very fast. They would almost appear to flutter as the stabilizer would travel up and down several times in one second. Sometimes one side would have that fluttering motion while the other side would stand still. This type of technology was something that probably all fighters built today possess. It was definitely the technology of the future back in 1977. Sorry to pop your bubble about the F-14 being a fly by wire type aircraft because it wasn't. There wasn't even a flight control computer. When you saw the horizontal stabs moving sharply as it landed on the ship is because of a device on the stick called a DLC( direct lift control) wheel, what this did was allow for minute inputs from the pilot to better control the aircraft during landing. On the good side its good to see that you spent a lot on the A-7. You mentioned the boarding ladder as a tube it actually was 3 square tubes one inside the other so it telescoped this was the type used on the A-7E the A-7A&B had a different ladder. Other than that you have some great pictures only wished that I took more pictures while I was in.